Our organizational growth is backed by technically advance infrastructural facilities that facilitate us in offering robust and durable equipments. Our manufacturing plant is spread over 15000 sq. ft. of area and is equipped with the latest and state-of-the-art machines that are highly efficient and productive. 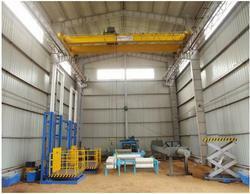 The installed capacity of these machines is 10000 units which enables us to adhere to delivery schedule. Further, we also have an in-house design unit, which is equipped with the latest CAD/CAM facility, used by our designers to design innovative industrial equipment. Product design and development being a crucial factor in engineering industry, we have maintained a well organized research and development unit for innovating improved designs of equipment. Our competent team of researchers is continuously engaged in innovating new technology to increase production capacity and reduce production cost. Improved technology also enables us to make efficient utilization of available resources, reducing material wastage. Our researchers stay abreast with the changing market requirements and work in coordination with production engineers to incorporate new features in the equipment range. We possess a capacious warehouse, to store our raw material, semi-finished and finished equipment. Our warehouse is segregated into various sections which assist us in easy storage and retrieval of the stored hydraulic equipment. The warehouse is properly managed by a team of warehousing experts, who keep a strict vigil on the stored products. Additionally, we also ensure safe and proper delivery of our engineering equipment to the clients. Our packaging professionals pack the consignments as per the specifications provided by our clients using the qualitative packaging material. In order to have smooth execution of trade tasks, a modern infrastructure set up is built by us as per prevailing architectural layout. Our firm has maintained a designing cell, where blue-prints and plans are prepared for products. The manufacturing cell covers the major area, several hi-tech machines and tools are updated in it so that entire gamut can be produced in a good speed. Moreover, we have a spacious warehouse, where entire self made as well as raw material is safely stored till dispatch. Furthermore, our different divisions namely admin, sales & marketing, quality aid in smooth functioning of the firm.